Neuropsychological testing can identify changes in cognition, behavior, and emotion; aid in determining the cause of a disorder or developmental problem; and assist clinicians in planning treatment and rehabilitation. To use these tests properly, professionals need an authoritative source of advice and guidance on how to administer, score, and interpret them. Now fully revised and in a second edition, Essentials of Neuropsychological Assessment is that source. 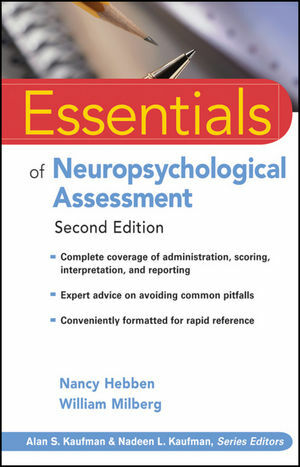 Essentials of Neuropsychological Assessment, Second Edition provides comprehensive instruction on neuropsychological test administration, scoring, interpretation, and report writing. It also addresses practical and conceptual issues related to neuropsychological assessment in geriatric, pediatric, forensic, and other specialized settings. Nancy Hebben, PhD, is an Assistant Professor of Psychology in the Department of Psychiatry, Harvard Medical School, and a Clinical Associate in the Department of Psychology at McLean Hospital in Belmont, Massachusetts. William Milberg, PhD, is an Associate Professor of Psychology in the Department of Psychiatry, Harvard Medical School, and the Associate Director for Research of the New England Geriatric Research, Education, and Clinical Center, VA Boston Healthcare System. One: Introduction to Neuropsychological Assessment. Two: The Discipline of Neuropsychological Assessment. Three: Essentials of the Interview And Clinical History. Four: Essentials of Test Selection, Administration, And Scoring. Six: Special Issues in Neuropsychological Assessment. Seven: Essentials of Report Writing. Appendix A A General Guide for Neuropsychological Assessment. Appendix B Essentials of the Neurobehavioral Syndromes.